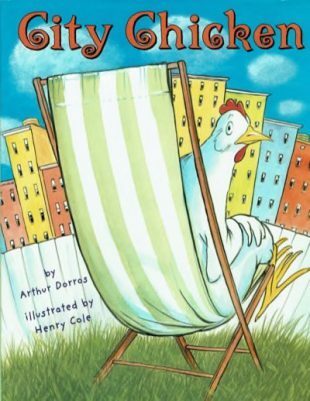 A city-living chicken named Henry, short for Henrietta, is a somewhat unusual chicken. She eats pizza, strawberries and waffles, and lays blue eggs-yet she has never seen the country or the animals that can be found there. After hearing about the country from Lucy, the cat next door, Henry takes flight in a wild journey to see the country herself. She is confused about what a cow, pig or horse is, but Henry discovers she is not confused about the place she prefers to call home. Strangely enough, in our city backyard lives a chicken nick-named Henry. Henry lays blue or blue-green eggs, depending on how much pizza she has been eating, and communicates daily with Lucy the cat. A boy named Alex, as the character in the story, cares for her. All of these are coincidences which clearly have nothing to do with how the story came to be, or so the author says. Besides, have you ever seen a chicken riding a bus? If you’ve ever met a chicken, been confused, or looked for a green-grass home, you may understand what Henry goes through. Best wishes for your own travels!